Around two and a half years ago, before Constantine took over as the manager of the national team, Indian defences were often ripped to shreds and scoring a goal was as rare as seeing a blue moon in the sky. All that seems to be in the distant past now as India put in a resolute performance against a strong Kyrgyz Republic team with Captain Fantastic Sunil Chhetri's goal enough to see the Middle East country off. To read the match report and watch highlights of the game, click here! Stephen Constantine is an exemplary coach and a very good example of one who knows how to move his players around to ensure that his team exerts technical and tactical superiority over their opponents. The team was fluid in its formation and switched from 4-3-1-2 to 4-4-2 to 4-2-3-1 at different stages of the game. This led to the Kyrgyz team struggling to keep their shape and affected them both in their defence and attack. In fact, the substitution of Mohammed Rafique in place of midfield strongman Rowlin Borges proved to be the masterstroke. It added a new dimension and speed to the attack and disrupted the well settled Kyrgyz defence, who did not see it coming. Rafique forced the Kyrgyz team to play on the back foot as he exerted his dominance on them and opened the play up for Chhetri and Jeje Lalpekhlua to move further forward. This helped Chhetri to construct a brilliant move laying the ball off to Lalpekhlua who brilliantly chipped it over to the captain who put the ball in the back of the net with a well-placed shot to the bottom corner. Captain Fantastic with amazing strike for India to seal 3 points. 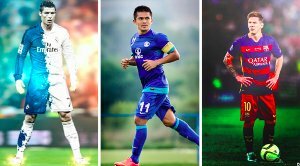 One of the most underrated aspects of last night’s game was the defence consisting of Pritam Kotal-Sandesh Jhingan-Anas Edathodika-Narayan Das. The full-backs were unrelenting in their moves forward to support the attack but when it came to their defensive duties, they were flawless as well. The centre-back pairing was nothing short of exceptional as they almost shared a telepathic link with each other and Gurpreet Singh Sandhu. The defensive tactics were, in fact, Jose Mourinho-esque reminding of the era when John Terry, Ricardo Carvalho and Petr Cech formed an impenetrable back three for Chelsea. Their movement on and off the ball was like watching a well-choreographed performance. The defenders instinctively knew when to retreat, when to tackle and who would clear the ball without bungling up any of the situations. One shining moment was when the Kyrgyz attack was able to get around the charging Sandhu but their shot was blocked by Jhingan. Both defenders were never shy to put their bodies in line for the national crest. Although after yesterday night’s performance we can’t stop singing the praises of the Hero of the Match, Sunil Chettri for his beautiful performance, we cannot ignore the impact Sandhu had on the game. Charging when needed, diving and comfortably keeping the ball out of his net without even breaking a sweat, he showed why he has become the first choice goalkeeper at Stabaek. A matter of worry for Constantine would be the midfield, which was absent for major parts of the match. Eugenson Lyngdoh worked very hard but wasn’t able to impact the game in any way until Rafique came on. Borges wasn’t the best in both the defensive midfield role and did not contribute immensely moving forward. Jackichand Singh put a few good crosses in but angered Kotal many-a-times as he failed to track back effectively. 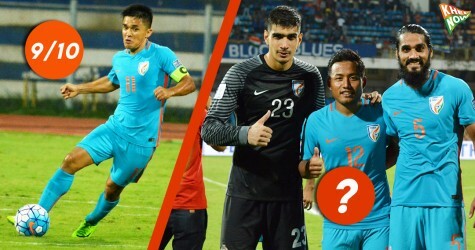 On the other wing, Holicharan Narzary set a new standard for wingers in India as he excelled both in attack and defence, providing an apt cover to Das and frequently breaking up the Kyrgyz attacks. The Indian team must work on its finishing, as the hosts missed at least four convertible chances. Robin Singh, when put through one-on-one by Sunil Chhetri at the tail end of the game, should've scored. Chhetri himself, bit the dust in the last minute as he beat four defenders into the box and had only the keeper to beat, but shot over. In the end, it didn't really matter much. The team do not attack much, defends sturdily and is dominant on the counter. If this is how Constantine believes the team can win things, so be it. Overall India struggled to settle into a rhythm in the first half but came good in the second. A lot of areas, especially midfield needs improvement and stronger legs. Moving forward, the hosts were over-reliant on Chhetri, who never disappoints but as the coach prompted, is not 22 anymore. 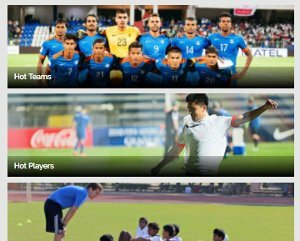 The Indian team need to continue this winning momentum if they're to achieve the Asian dream and one day play in the World Cup and we hope the AIFF keep Constantine to steer the team in the right direction.